Coalport, Colebrook Dale, Shropshire: established in 1795 by John Rose, who had been an apprentice at Caughley until 1785, when he started a small pottery at Jackfield on his own account. 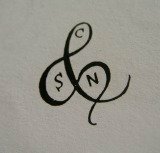 In 1795 he moved to Coalport and built premises on the canal bank opposite Caughley, which he acquired in 1799, and absorbed in 1814. By 1798 Rose was making bone china and until the late 1820s was largely engaged in supplying this in the white to London and provincial dealers end enamellers, althogh much decorated ware was sold. After the death of John Rose in 1841 he was succeeded by his nephew William F. Rose and William Pugh , the latter becoming sole proprietor in 1862. Now housed at Stoke-on-Trent, the factory is still in production. A pair of Coalport porcelain dessert plates c.1820-25, each painted with a superb central study of flowers (probably painted by Thomas Brentnall) the border with ellaborate gilding. Dimensions: 22 cm diam. Condition: minor ware on the gilding. Unmarked. 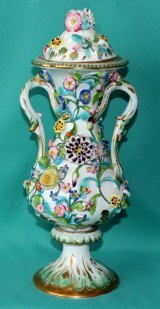 A Coalport "Coalbrookdale" porcelain vase and cover c.1830, rococo style, finely modelled handles and typical flower-encrusted decoration, painted in coloured enamels and gilt. Dimensions: 31.5 cm. Condition: small chips on the flowers, the cover doesn't fit properly. Unmarked. A Part Thomas Rose Porcelain Tea set, Japan Pattern, c.1805-10. A Part Thomas Rose (Anstice, Horton & Rose) Porcelain Tea set, comprising a boat-shaped teapot and cover, teapot stand, shucrier and cover and a slop bowl, finely painted with a colourful " Japan" pattern., c.1805-10. Dimensions: teapot 17.5 cm x 25 cm from handle to spout , shucrier 14 cm high, teapot stand 18.5 cm x 15 cm , slop bowl 16 cm diam. Condition: teapot cracked. Unmarked. * For similar shapes see : " Coalport 1795-1926" 1995 by Michael Messenger, page 82-84, plates 28,29,32. A Very rare Coalport Porcelain Trio, by Thomas Rose (Anstice, Horton & Rose) comprising a coffee can, teacup and saucer, hybrid hard-paste body, finely painted in "Tobacco Leaf" pattern with flowers, Pattern 557, c.1810. Dimensions: coffee can 6cm high x 7cm diam, teacup 6cm high x 8.5cm diam, saucer 14cm diam. Unmarked. Excellent condition. An early John Rose porcelain part teaset, comprising a teapot and cover, sucrier and cover, three teabows and three saucer dishes of "shanked" shape, hybrid hard-paste body, painted in blue underglaze and gilt. c.1796-1800. Unmarked. Condition: Finial broken/re-glued, one teabowl with a tiny hairline. A Rare Early Coalport Armorial Plate c.1805-10, hybrid hard-paste porcelain, lobed-edge form, painted with a family crest in the centre, gilded rim. Dimensions: 20.5cm. Unmarked*. Excellent condition. A Coalport flower-encrusted porcelain basket in the "Coalbrookdale" style c.1830, the interior finely painted with summer flowers, the exterior in cobalt blue and gilt. Dimensions: 18 cm. high x 23 cm long. Condition: fine, just some minor chips on the flowers. Unmarked. * A similar porcelain basket is illustrated in the book " Coalport 1795-1926" , 1995 by Michael Messenger, page 208, plate 166. A Coalport Part bone china Tea/Coffee Set in Rococo Style c.1835, finely painted with flowers on rich maroon ground and elaborate gilding, comprising a teapot,1 milk jug, 1 slop bowl, 1 cake plate, 2 coffee cups, 4 tea cups and 8 saucers. The cups and saucers in "Adelaide" shape, the teapot with small "duck's beak", squat finial, the handle spur short and high. 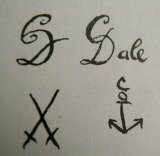 Marks: Pattern 3/563. Condition: Teapot excellent, three hairlines and one cup & saucer chiped. 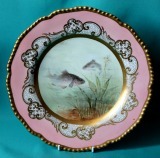 A Coalport Porcelain Cabinet plate c.1890-1900, gadroon edge, the border with elaborate gilding on pink ground, finely painted in the centre with fish, signed by the artist J.H.Plant. Dimensions: 23 cm diam. Printed marks in blue on the base. Excellent condition. A Pair of Coalport Porcelain Plates c.1890-1900, possibly painted by J.H. Plant, the sentre decorated with a landscape, surrounded by six panels in maroon, heavily moulded, misshapen rim with acanthus leaves and flower heads, raised gilding. Pattern x304, one plate inscribed: "Kilchurn Castle". 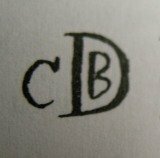 Printed marks in blue. Dimensions: 23.5cm. diam. Fine condition. A Coalport pink-ground shaped-circular ornithological plate c.1900, the centre finely painted with a catch of game birds in their natural habitat within foliate gilt surround, named on the underside, the border with four panels of gilt hunting trophies alternating with four cartouches of gilt trellis. 24.2cm diam.Green printed marks. signed J.N.Bradley. Excellent condition. A Coalport Armorial Dinner Plate c.1830, with gadrooned edge, the border decorated with finely painted flowers on a maroon ground,embossed gilding, the centre with the family crest of the Duke of Rutland. Dimensions: D. 10"(25.5cm). Marks: Impressed "2". Condition: Slight ware. A Pair of Coalport Cups & Saucers c.1818, Etruscan shape and "hairpin" handle, decorated with panels of flowers in a cobalt blue ground, elaborate gilding. Marks: Pattern 898 in gilt, one cup with 992 in red. Condition: One cup with a hairline.